Yes you read that correctly. Delicious & medicinal in the exact same sentence and context. Who doesn’t love delicious pancakes & waffles (clearly defined as; crispy on the surface and soft in the middle), topped with ice-cream, jam and peanut butter ? – Increased ability to absorb vitamins, nutrients and amino acids (protein). All packed in the same delicious breakfast meal. All claims backed up with scientific references (click here to read) . All you have to do is to follow the recipe below every morning for the rest of you life. The following gives 4 pancakes or 4 waffles + a healthier life. You can use same final dough to make either waffles or pancakes. To achieve maximum deliciousness & health benefits mentioned above, it is absolutely required to use organic ingredients. 2 dl of oat milk. The procedure is very simple and takes about 5 – 10 minutes . 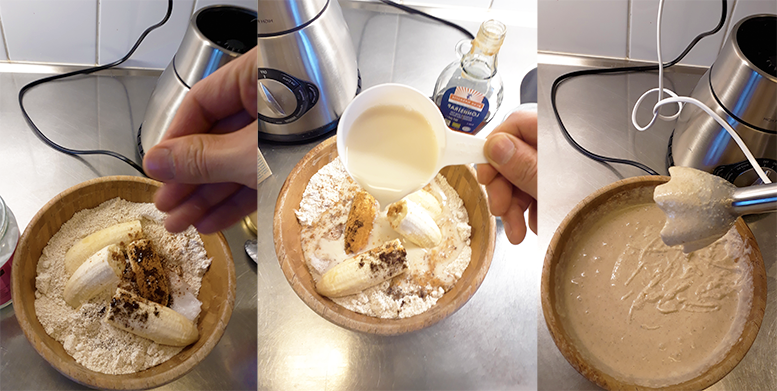 Even thought its highly recommended to read through the entire recipe before starting; it all really comes down to mix all ingredients together in a bowl, and you will have your batter (pancake/waffle-dough). This dough can then be used to either make pancakes or waffles. If you can find oatmeal flour at the store, then you could technically just mix all the ingredient together with a hand mixer and you will have your batter (pancake/waffle-dough).. HOWEVER, its usually hard to find organic oatmeal flour, and there are a few potential pitfalls; so I will share with you exactly how I make this dough and the experience I had of the things that could go wrong. Below is the step-by-step procedure of how I do it. 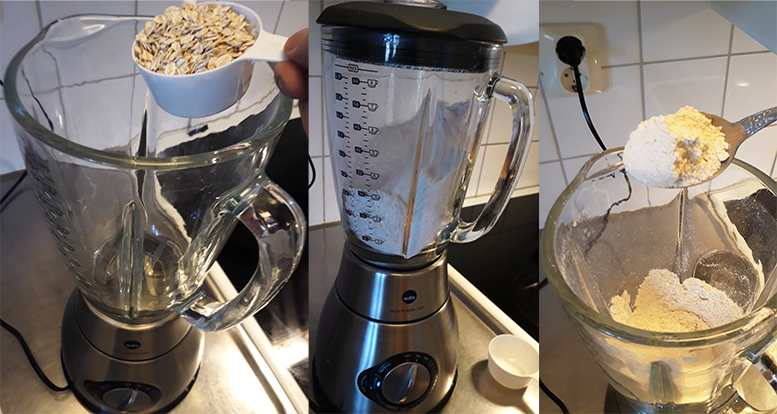 Simply, add 4 deciliter of organic oatmeal (regular type that can be found in almost all stores) in a blender and mix for about 1 min. And that is it. You have now about 4 dl oatmeal flour. First; pour the 4 dl of the oat-flour that you just made into a bowl. Then; add the rest of the ingredients, except the oat-milk. A big pitfall here is to use too big bananas. If you do that, the batter (pancake/waffle-dough) will get too thick and sticky, hard to work with and have a tendency to over toasted too quickly. So, if you have midsize or small bananas you can add 2 of the in the bowl, but if you have big bananas; them only add 1, or 1-and-a-half. And finally; add the 2 dl of oat milk and mix well until you have a nice and thick, yet soluble batter. Take 1 deciliter (dl) of the batter/dough for each waffle or pancake. 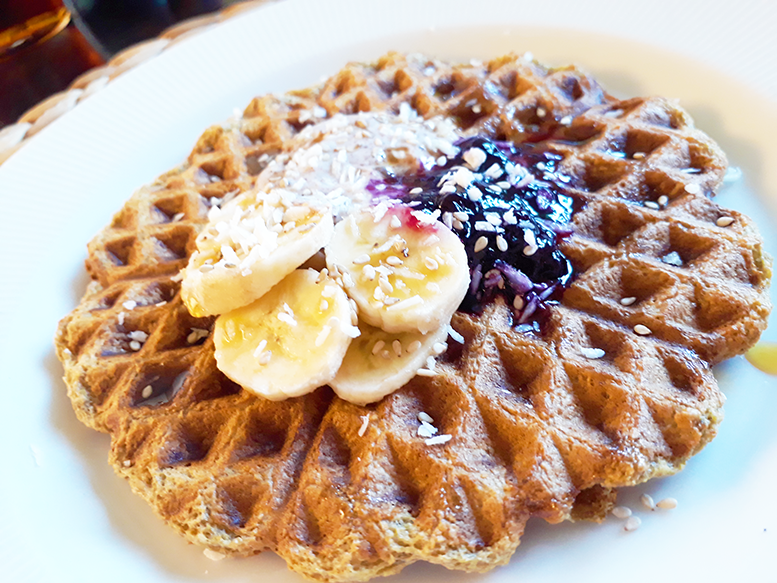 Use a tiny amount of coconut oil to make sure the waffles will not stick to the waffle iron. 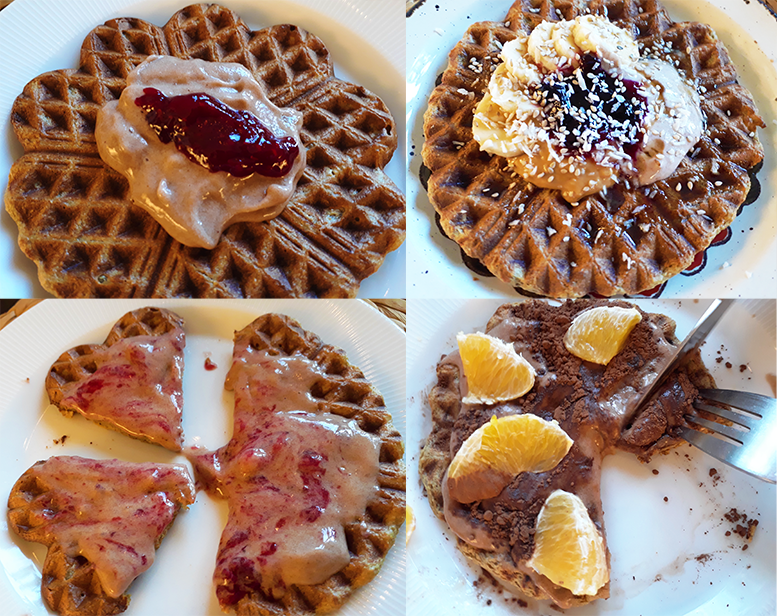 Using our waffle iron at home, we figured out we didn’t even need to use any oil, but that can vary depending on what modle/ type or a waffle iron you have. If you don’t have a waffle iron; you can use a frying pan to make regular pancakes. First; heat a lightly oiled frying pan over medium high heat. Then; Pour 1 dl of the dough/batter onto the griddle, using approximately 1/4 cup for each pancake. Brown on both sides and serve hot. – Banana, orange, melon or other fruits and berries. May this bring you much joy and healing altogether.